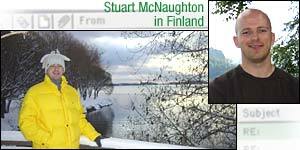 Deaf from a young age, Stuart McNaughton found that regaining his hearing at 23 gave him the confidence to live abroad. He explains in our series featuring expatriate readers of BBC News Online. I was profoundly deaf for 22 years, then I received a cochlear implant which restored my hearing. I heard music and TV, speech and the telephone for the first time in years. Within six months, I'd seen a job in Finland on the company intranet and felt confident enough to apply for it. I now live in Tampere, 170km north of the beautiful capital Helsinki, and work on a global finance project for a paper products company. What a change in lifestyle. Not only am I getting used to living in a new country, let's face it, how many Brits - let alone someone who used to be profoundly deaf - have managed to learn and speak Finnish? It's a very harsh language, sometimes it hurts to listen to it. I got my first hearing aid at the age of three, having lost my hearing at 15 months - I'd been rushed to hospital with suspected meningitis, but the doctors never found anything. At 21, I was referred to a specialist to get a cochlear implant. I was operated on in February 2000, and the implant was switched on the following month. I could hear again, enabling me to contemplate living abroad. I made my first unaided phone call at the age of 24; I heard Kylie Minogue - my babe - in concert earlier this year without having to turn a hearing aid up; and now I'm living and working in a foreign country. The only problem is that I can't always recognise what a certain sound is because I missed the development phase when I was a baby. In June I went to a national park to make the most of the 20-hour days Finland has in summer. I heard a cuckoo for the first time in my life - and I had no idea what it was. I find that I'm learning all the time - learning a new language, learning sounds. It's exciting but sometimes I just need to chill out and recover. When my contract comes to an end next year, I'd like to stay on not least because the cost of living is considerably less. Like many 25-year-olds, when I was in the UK I could hardly afford to leave home. In Hertfordshire, I had a tiny flat for £650 a month; here I've got a big apartment - with a private sauna - for about £330 a month. And I can travel 200km for £12; it cost me that to go 50km from Hitchin to London. Although Finland is far bigger than the UK, just five million people live here so it's true that someone knows someone who knows someone. They do seem to be a shy people, but once the ice is broken you are "friends for life". The population of Tampere is just 200,000 - and it's Finland's second city. I found it quite disconcerting at first, seeing the same people in the same place each day. "I subscribe to BBC Prime so I can watch EastEnders"
I do prefer Helsinki, it's very international and colourful whereas Tampere is more family-orientated. I'm young and single, so you can see why I go to Helsinki most weekends. But the atmosphere here is so relaxed, and it's very safe too. I brought my car over and I've left it unlocked many times with no problems. It's a lovely feeling, not having to be so careful. All in all, I've found integrating in Finland so easy. If you want to live abroad, just leap. Every Tuesday we bring you the story of a Briton who has upped sticks and moved abroad. Do you live far from home? Tell us your experiences, using the form below. I now have what is the perfect life for any single 25-year-old man. I spend 9 months studying in Sweden and summers on Guernsey, playing and coaching cricket on a very beautiful and very social island. I look forward to reading more tales of intrepid expats and would love to know if anyone has developed a full proof method of explaining cricket! Love this series. Even though I know there are expats all over the world, it's nice to see something "real" about them. Just knowing that you're not the only one in an alien environment can keep you going. And it really makes me admire the strength that refugees show, especially in the face of discrimination. I have been away 5 years now and although I've had an amazing time and have become fluent in Swedish, there's no place like home. So I'm moving back to the UK for good at the weekend. Good luck to those living abroad - I just hope I will enjoy living in the UK again. The older I am, the more difficult this becomes. I am 35 next month, but between 26 and 30 I lived all over the place and had a complete blast. Eventually I spent two and a half years "settling" into a London lifestyle before I found myself bored silly. Now I'm in Montpellier and this time it's harder to adapt. I'm no longer able walk into a bar and chat to the nearest group of fellow drunkards. I'm not zimmer-frame old, it's just I'm beyond the stage of where I'm able to form instantaneous lifelong friendships - which isn't necessarily a bad thing. Still wouldn't want it any other way! I really like the Finns as you know where you are with them, people say they are cold but I personally think it's just that they don't do small talk. I have travelled back and forth for the past 3 years and always feel safe, happy and relaxed when I'm there. Now I can't wait until my move there next March. I live in Mobile, Alabama, a place I had never heard of before I applied for a job here. My parents were a bit concerned as there was a hurricane which made the UK news just after I was interviewed. I love life here: it's inexpensive, summers are very long and hot and winters very mild. I do miss many things about home, mostly family and friends. But the US is becoming my new home as I am marrying my American boyfriend in Ireland in May 2003. I now live near Hanover in Germany. It felt like being on holiday for the first few months but have settled in now. Currently enjoying the many Christmas markets and looking forward to snowboarding most weekends in the Hartz Mountains a couple of hours drive away. I spent 6 months in Oulu, working for a hi-tech company as part of a vocational placement. I adored Finland and really miss its Old World values. And what an experience: -40C, driving on frozen lakes, Finnish beer. I moved to Rome more than 2 years ago, at the age of 26. My friends couldn't understand why I wanted to leave them and the UK, but something inside made me take the leap. And thank God I did - I will marry my Italian girlfriend in Rome next May. Viva Italia! I've met on my travels several deaf expats who've proved to themselves that deafness needn't be a barrier to living abroad. Also you'll find among London's large deaf community many residents not only from Oz, NZ, and South Africa but also Hungary, Spain, and even Finland itself. At 23, I have lived in Zeeland for two years after applying to do international work experience with a Dutch university. My Dutch boyfriend and I have now (easily!) applied for a mortgage and bought a house. I am struggling with the language, although I've taken classes for the past year. Luckily I work for a US company and everyone (even the kids) speak excellent English. But I am determined to get to grips with the language! I moved to Wollongong about 12 months ago. I work at a nature reserve looking after infant kangaroos. The weather is better, the food is better, but lager isn't as strong. Really it's the UK with a bit of sun. I moved to Vienna permanently in July after marrying my Austrian partner. Adjusting is difficult, whether you have only moved within Europe or further afield. It's reassuring to read about other people's experiences. I moved to Finland in 2000 with my family. My children went to a local school in Jyvaskyla and my wife started to learn Finnish. We have since moved to Canada but still remember with fondness our time there. I still return to Finland on business so get a chance to use my broken "Finnglish". I now work for a Finnish company in a part of Canada with a large Scottish heritage and I have gone almost full circle. Every e-mail sent will be read, and we will be in touch if more details are needed.